Robert Willoughby, 1st Baron Willoughby de Broke, de jure 9th Baron Latimer (c. 1452 – 23 August 1502), KG, of Brook (anciently "Broke"), in the parish of Heywood, near Westbury in Wiltshire, was one of the chief commanders of the royal forces of King Henry VII against the Cornish Rebellion of 1497. Robert Willoughby was born at Brook (anciently "Broke"), his father's estate then in the parish of Westbury, Wiltshire, now in the later parish of Heywood. He was the son of Sir John Willoughby of the family of the Barons Willoughby of Eresby, seated at Eresby Manor near Spilsby, Lincolnshire. His mother was Anne Cheyne, 2nd daughter and co-heiress of Sir Edmund Cheyne (1401–1430) of Brook, by his wife Alice Stafford, daughter of Sir Humphrey Stafford of Hooke, and an aunt of Humphrey Stafford, 1st Earl of Devon (died 1469). Sir Edmund was the son and heir of William Cheyne (c. 1374–1420) by his wife Cecily Strecche (d. 1443); William was the son of Sir Ralph Cheyne (c. 1337–1400) of Poyntington in Somerset, and of Brook (three times a Member of Parliament for Wiltshire, Deputy Justiciar of Ireland, Lord Chancellor of Ireland, and Deputy Warden of the Cinque Ports) by his wife Joan Pavely, daughter & co-heiress of Sir John Pavely of Brook. He was High Sheriff of Cornwall in 1479 and High Sheriff of Devon in 1480. He was Lord of the Manor of Callington and steward of the Duchy of Cornwall. The barony of Willoughby de Broke, named after the manor of Brooke/Broke, Heywood, near Westbury, Wiltshire, was created when Robert Willoughby was summoned to Parliament by writ in 1492. On his death on 23 August 1502 the title passed to his eldest son Robert Willoughby, 2nd Baron Willoughby de Broke. He died at the manor house of Callington, for he directed in his will that he should be buried in the church of the parish he died in. He married in 1472 Blanche Champernowne, daughter and heiress of John Champernowne of Bere Ferrers, Devon, by Elizabeth Bigbury. John was the son of Alexander Champernowne of Modbury and Joan Ferrers, da. of Martyn Ferrers of Bere Ferrers. He thus acquired the manors of Callington, Cornwall. and Bere Ferrers amongst others. Robert Willoughby, 2nd Baron Willoughby de Broke (d. 1521). Predeceased by his son and heir Edward, whereupon the title became abeyant in 1521 between Edward's three daughters and was terminated around 1535, when daughter Elizabeth became sole heiress. Buried at Bere Ferrers. Elizabeth, who married firstly John Dynham, 1st Baron Dynham, and secondly William FitzAlan, 18th Earl of Arundel. Hamilton Rogers, William Henry The Ancient Sepulchral Effigies and Monumental and Memorial Sculpture of Devon, Exeter, 1877, pp. 346–7 & Appendix 3, pedigree of Willoughby de Broke. Leigh Rayment's Peerage Pages – Peerages beginning with "W" (part 2) "Wellesley to Willoughby of Parham". Lundy, Darryl (3 June 2008). "Robert Willoughby, 1st Baron Willoughby de Broke". The Peerage. Baron Willoughby of Broke from Crofts Peerage. ^ Mis-drawn and mis-blazoned by Rogers as a cross engrailed. The Bere Ferrers bench ends, where perhaps the wood disallows great detail in carving, shows not a cross crosslet but rather a thick plain cross. ^ Rogers, p.346, quoting "Lysons"
Baron Willoughby de Eresby is a title in the Peerage of England. It was created in 1313 for Robert de Willoughby. Since 1983, the title has been held by Jane Heathcote-Drummond-Willoughby, 28th Baroness Willoughby de Eresby. Baron Willoughby de Broke is a title in the Peerage of England. It was created by writ in 1491 for Sir Robert Willoughby, of the manor of Broke, part of Westbury, Wiltshire, who according to modern doctrine was de jure 9th Baron Latimer. On the death of his son, the two baronies fell into abeyance. Around 1535, the abeyance was naturally terminated when the second Baron's granddaughter Elizabeth, who had married Sir Fulke Greville, became the only surviving co-heir, passing her claim to her son Sir Fulke Greville, father of the poet of the same name. The title stayed in the Greville family until after the death of the 5th Baron, when it passed to his sister, Margaret Greville, the wife of a Verney. Thereafter it remained in the Verney family. The Barons Willoughby de Broke remain heirs to the ancient Barony of Latimer. Robert Willoughby, 2nd Baron Willoughby de Broke and de jure 10th Baron Latimer, was an English nobleman and soldier. John Dynham, 1st Baron Dynham of Nutwell in the parish of Woodbury and of Hartland, both in Devon, was an English peer and politician. He served as Lord High Treasurer of England and Lord Chancellor of Ireland. He was one of the few men to have served as councillor to Kings Edward IV, Richard III and Henry VII and was trusted by all of them. Brook in the parish of Heywood, near Westbury in Wiltshire, England, is an historic estate. It was the seat of Robert Willoughby, 1st Baron Willoughby de Broke (c.1452-1502), KG, an important supporter of King Henry VII, whose title unusually incorporates the name of his seat, in order to differentiate him from his ancestors Barons Willoughby of Eresby, seated at Eresby Manor near Spilsby in Lincolnshire. A medieval wing survives of the mansion house known as Brook Hall, a Grade I listed building situated near the Biss Brook. Heanton Satchville was a historic manor in the parish of Petrockstowe, North Devon, England. With origins in the Domesday manor of Hantone, it was first recorded as belonging to the Yeo family in the mid-14th century and was then owned successively by the Rolle, Walpole and Trefusis families. The mansion house was destroyed by fire in 1795. In 1812 Lord Clinton purchased the manor and mansion of nearby Huish, renamed it Heanton Satchville, and made it his seat. The nearly-forgotten house was featured in the 2005 edition of Rosemary Lauder's "Vanished Houses of North Devon". A farmhouse now occupies the former stable block with a large tractor shed where the house once stood. The political power-base of the Rolle family of Heanton Satchville was the pocket borough seat of Callington in Cornwall, acquired in 1601 when Robert Rolle purchased the manor of Callington. Sir John Dinham (1359–1428) was a knight from Devonshire, England. His principal seats were at Hartland in North Devon, Kingskerswell and Nutwell in South Devon, Buckland Dinham in Somerset and Cardinham in Cornwall. He killed one of the murderers of his father in Exeter Cathedral, for which he was pardoned by the king. He later broke into Hartland Abbey and assaulted the Abbot over a long-standing disagreement, and also performed other acts of violence. He married three times; his heir was John Dinham (1406–1458). His monument survives in Kingskerswell parish church. The historic manor of Tawstock was situated in North Devon, in the hundred of Fremington, 2 miles south of Barnstaple, England. According to Pole the feudal baron of Barnstaple Henry de Tracy made Tawstock his seat, apparently having abandoned Barnstaple Castle as the chief residence of the barony. Many of the historic lords of the manor are commemorated by monuments in St Peter's Church, the parish church of Tawstock which in the opinion of Pevsner contains "the best collection in the county apart from those in the cathedral", and in the opinion of Hoskins "contains the finest collection of monuments in Devon and one of the most notable in England". Sir Ralph Cheyne, of Brooke, in the parish of Westbury in Wiltshire, was three times a Member of Parliament for Wiltshire and was Deputy Justiciar of Ireland in 1373 and Lord Chancellor of Ireland 1383-4. He was Deputy Warden of the Cinque Ports. Mohuns Ottery or Mohun's Ottery, is a house and historic manor in the parish of Luppitt, 1 mile south-east of the village of Luppitt and 4 miles north-east of Honiton in east Devon, England. From the 14th to the 16th centuries it was a seat of the Carew family. Several manorial court rolls survive at the Somerset Heritage Centre, Taunton, Somerset. St Andrew's Church in Bere Ferrers, Devon, is a parish church in the Church of England The church contains the oldest stained-glass window in Devon, dated at 600 years old. The building was probably built at various times between 1290 and 1340; it is recorded that an archpresbytery was founded here in 1333 and the north transept appears to be the earliest part of the church while the south aisle is the latest, perhaps 15th century. Nicholas Carew, feudal lord of Carew Castle in Pembrokeshire, feudal lord of Odrone in Ireland and lord of the manor of Moulsford in Berkshire, was a soldier. He was the first of the Carew family to form a connection with the English county of Devon, where his descendants became very prominent until modern times. 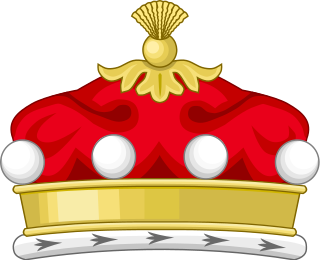 His descendants obtained three Carew baronetcies and four peerage titles, namely Baron Carew (1605) in the Peerage of England and Baron Carew (1834) in the Peerage of Ireland and Baron Carew (1838) of Castle Boro in the County of Wexford, in the Peerage of the United Kingdom. Sir Edmund Cheyne (d.1374/83) of Poyntington in Somerset, was a Member of Parliament and served as Warden of the Channel Islands 1358-1367. John Twynyho of Cirencester, Bristol and Lechlade, all in Gloucestershire, was a lawyer and wealthy wool merchant who served as Recorder of Bristol, as a Member of Parliament for Bristol in Gloucestershire in 1472-5 and in 1484 and for the prestigious county seat Gloucestershire in 1476. In 1478 he was Attorney General to Lord Edward, eldest son and heir of King Edward IV.